Humans today rely upon just 20 varieties of plants for 90 percent of their food. Experts throughout the world think that this lack of biodiversity could lead to an agricultural calamity. The Irish potato famine, which led to the death or displacement of two and a half million people in the 1840s, is an example of what can happen when farmers rely on only a few plant species as the cornerstone of their crops. Know your seeds! In just the last 15 years, more than half of the varieties once available have disappeared from seed catalogs. By contrast, Seeds of Change, an alternative seed company, grows over 2,000 kinds of seeds—a hundredfold increase in the number of edible plants available to most people today. 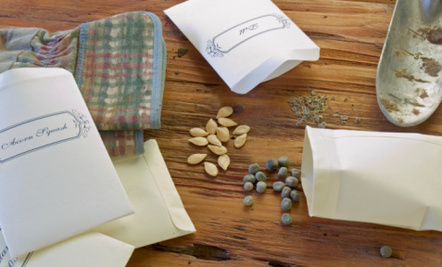 The seed-preserving work of backyard gardeners and companies like Seeds of Change, total seed species and their varieties will disappear forever. FYI Save the silica packets from vitamins and new shoes to keep stored seeds safe from humidity. Recycling and nuture Mother Earth allin one ! I think veggie seeds could be the new money in the near future. Thanks, Annie. And thank you, Niki S., for the new link. If you want more information on HOW to save seeds, I highly recommend "Seed to Seed" (by Susan Ashworth. As for the WHY, almost anything by Gary Paul Nabahn. For example, "Enduring Seeds." Both are excellent books.